The clinical correspondence section of the New Zealand Medical Journal often throws up rare and random cases that doctors around the country have had to deal with. Back in 2010 there was the acupuncturist who pierced a patient’s lung. Then came the girl who swallowed her toothbrush and had to have it surgically removed. Now – the kayaker who was bitten by a katipo spider. The katipo is a tiny, seldom seen spider that inhabits the borders of sand dunes and beaches the length of the country. It is also in decline which has seen them classified as Absolutely Protected under the Wildlife Act. The katipo – night stinger in Maori, has attained legendary staus in New Zealand for its nasty though rarely inflicted sting. In a country that has few species capable of delivering a venomous bite harmful to humans, the katipo stands out as one that can prove lethal to us. When you learn of its family lineage, you’ll understand why. These spiders belong to the worldwide genus Latrodectus, more commonly known as the widow spiders. 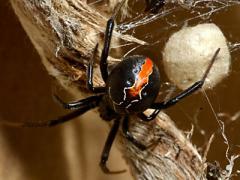 Members of this group include the Australian redback (Latrodectus hasselti) and the black widow (L. mactans) of North America. All members of this genus share a similar reputation for inflicting unpleasant and sometimes fatal bites on humans. It is worth noting that only the female is capable of biting a person, as the male’s fangs are too small. Given their timid nature and sparse numbers, katipo don’t tangle with humans often. However, a 29 year-old man who was recently ocean kayaking down the east coast of the North Island and setting up camp each night near the beach, got more than be bargained for when he set up camp near a katipo’s beach pad on Mahanga Beach, Mahia. While eating dinner in the sand dunes, he felt something crawling on his left calf, and brushed it off with his hand. Half an hour later a sharp pain began in his left calf, and over the next few hours it intensified, migrated up his leg, and into his groin and lower abdomen. During this time, he also developed chest pain, nausea and oral tingling. spray for chest pain. The barrage of drugs weren’t enough however as the patient was still in great pain after treatment at Wairoa hospital. A toxicologist at the National Poisons Centre recommended administering red back anti-venom, which was duly done. Symptoms rapidly improved after the initial dose of 500 units of anti-venom IM, but they did not fully resolve. A second dose was given 2 hours later, which further reduced his pain. Additional supportive treatment included phenergan (25 mg PO) and IV fluids (1 L of normal saline). He was observed overnight, and discharged pain-free the next day with instructions that should pain recur, further doses of antivenom can still be given. The kayaker never saew the spider, but it is most likely a katipo was to blame because displayed classic signs of lactrodectism, a syndrome from spiders of the genus Latrodectus – redback, black widow and katipo included. The signs and symptoms include local and systemic pain and sweating, hypertension and nausea. In more serious cases pulmonary oedema, seizures, heart complications and even death have been reported, although there have no recorded deaths from katipo bites in the last century. In experimental animals [alpha-latrotoxin] causes nonspecific release of neurorransminers from presynaptic neurones and prevents re-uptake of transminers. It causes a massive influx of calcium ions and release of transminers. The influx of calcium is not blocked by calcium channel blockers. The toxic effect may be inhibited by earlier administration of concanavalin antivenom or by calcium-free subsrrate.8 Alpha-latrotoxin has proved a useful substance for experimental work on the action and identification of neurotransminers. Hornabrook, in his 1951 review of the early literature on katipo spider bites, found a total of 22 cases, including 2 deaths. Since 1951, there has been only one reported case of a katipo bite, involving severe myocarditis in a 22-year-old man, despite katipo spiders inhabiting coastal beach dunes around New Zealand. So a threat that fails to live up to the katipo’s legendary status… but an interesting insight into the power of a tiny predator’s powerful bite. Is the SKA slipping through our fingers? I’m Friday afternoon I got home and I felt really tired and just not myself and I notice a red and swollen dot on my neck and it’s still there and it’s really saw. I may have received a katipo bite about 8 years ago. I felt sharp prick like pain in my foot when walking the peninsula at papamoa beach, flicked something black away (as I assumed it was a sharp stick of sorts). Then within 30 mins I was nauseous, headache, had grey complexion, barely conscious, too lethargic to talk and had slowly intensifying pain at the ball of my foot. The next day I awoke to find my foot was unbearably painful with a distinctive bulls-eye like bite mark, although my other symptoms had receded. I was unable to walk comfortably for 9 months, and eventually had surgery to remove the scar tissue at the site of the bite, where I now have a hollow scar. Anyone know the likelihood this was a katipo? And what the potential other candidates for this injury would be?? Brendan – fair point, ideas what else it might be? To be honest, was dubious about that one David. It’s frustrating that these patients get hit by a barrage of treatments and that nobody actually saw a spider. Shake out your shorts/undies before putting them back on in New Zealand too? Not something Iâ€™ve have thought to do. bitten on the shaft, ouch! Then there was this one [pdf]. Hmm, I’ve often visited Mahanga Beach at Mahia and never spotted a katipo. Compared to many other Latrodectus species elsewhere, the fatality rate is extremely low (not withstanding the pain). They are very timid spiders- I’ve handled them in the past and the lack of aggression is remarkable. I am a little surprised the first symptoms of sharp pain took half-an-hour to manifest also. Poor guy sounded like he suffered a lot.